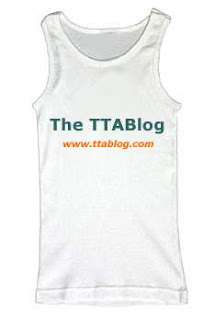 A divided Board panel ruled that the term WIFE BEATER for t-shirts is "immoral or scandalous" and runs afoul of the prohibition of Section 2(a) of the Trademark Act. The Board therefore affirmed a refusal to register the mark W.B. WIFE BEATER for t-shirts (WIFE BEATER disclaimed). In re Love Bottling Co., Serial No. 78171270 (June 21, 2005) [not citable]. The Examining Attorney contended that the mark is scandalous or immoral because, even in connection with t-shirts, the "primary meaning [of 'wife beater'] to a substantial composite of the general public is that of domestic abuse." She recognized the definition of the term as a slang term for a t-shirt, but asserted that this meaning is "inevitably tied to the offensive and scandalous meaning related to domestic abuse." In support, she submitted LEXIS and Internet excerpts showing use of the term "to describe spousal abuse, a certain type of t-shirt, and in some instances both." Significantly, she also submitted items showing "the reaction of the public to the use of the term WIFE BEATER in connection with t-shirts." Applicant Love argued that WIFE BEATER is descriptive (noting that the Examining Attorney required its disclaimer) and therefore cannot be deemed immoral or scandalous. Love's evidence comprised various Internet excerpts referring to "wife beater" as a type of t-shirt. The Board pointed out that, in order to sustain a Section 2(a) "immoral or scandalous" refusal, precedent requires the PTO to demonstrate that the mark is "shocking to the sense of truth, decency, or propriety; disgraceful; offensive; disreputable; ... giving offense to the conscience or moral feelings; ... [or] calling out [for] condemnation." In re Mavety, 31 USPQ2d 1923 (Fed. Cir. 1994). The panel majority found it clear that the PTO's proofs established that "the ordinary meaning of WIFE BEATER is a person who engages in spousal abuse and that, in connection with this meaning, the term has a very negative connotation, which applicant does not contest." The PTO evidence also established that WIFE BEATER has become a slang term referring to a style of t-shirt, and even in that connection "evokes the connotation of spousal abuse." Applicant did not contest that either, but instead argued "that the term means t-shirts in connection with t-shirts." "In the final analysis, while the record shows that some part of the public may use this term in connection with t-shirts without flinching, clearly, the record also shows that a substantial composite of the general public are offended by use of this term in connection with applicant's identified goods and that this term has not shed its connotation of spousal abuse when used with t-shirts such that it would only evoke a tank style t-shirt and contain no offensive innuendo as to spousal abuse." As to Applicant Love's argument that a descriptive term cannot be scandalous, Judge Kuhlke noted that the Board was unaware of any statutory language or case law that supports such a proposition, and she further pointed out that Applicant failed to cite any support therefor. 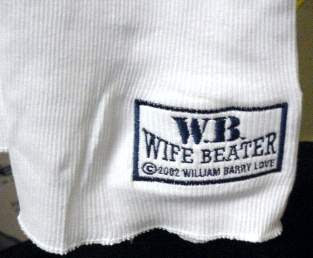 In dissent, Judge Seeherman emphasized that "[t]here is no evidence of record that applicant is using the term WIFE BEATER, in either its mark or its marketing materials, as anything other than a descriptive term to identify the style of its t-shirts." She acknowledged that the term, when used for t-shirts, "has an offensive connotation for some people," but "there is also substantial evidence that, to others, it does not." Consequently, she believed that, at the very least, the evidence of record was sufficient to raise doubt, and she would resolve that doubt (as required by precedent) in favor of the Applicant. Text Copyright John L. Welch 2005. All Rights Reserved.